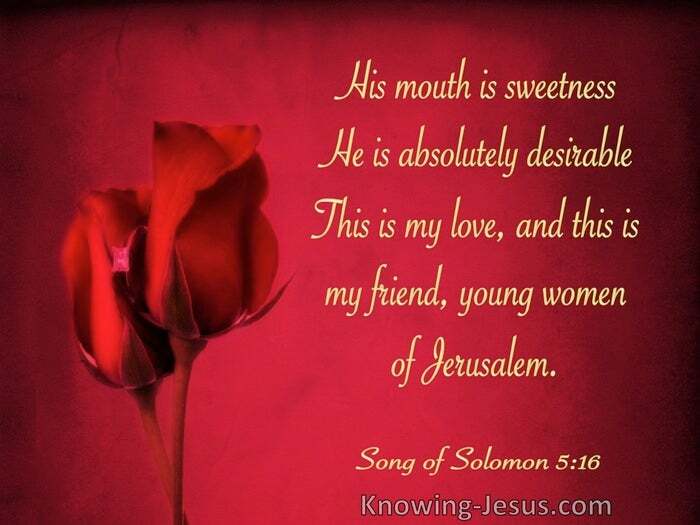 What Does Song of Solomon 5:16 Mean? His mouth is sweetness. He is absolutely desirable. This is my love, and this is my friend, young women of Jerusalem. 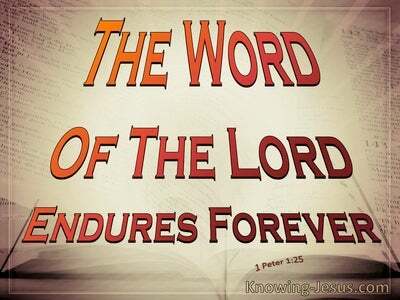 The truth of the good news of the Lord Jesus Christ and the many precious promised that surround the beauty of His Person – can only be described as the sweetest and most beautiful truths known to mankind. 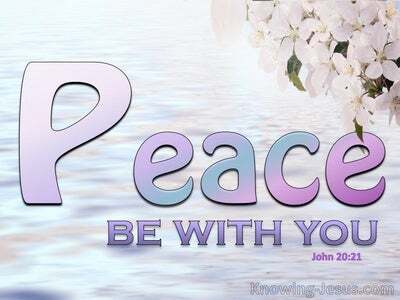 The glories of the gospel of grace from which flow love and joy and peace and hope and the salvation - and that brings with it eternal life are sweetness and light to all who believe. 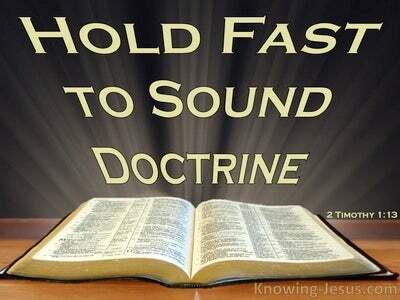 Grace and truth came to us through the Lord Jesus Christ, Who is the transforming light that streams into the inner recesses of man’s bitter soul - bringing new life and new hope and new joy into the inner recesses of man’s spirit. Jesus Christ is indeed altogether perfect. He is Perfect in His deity. Perfect in His humanity. 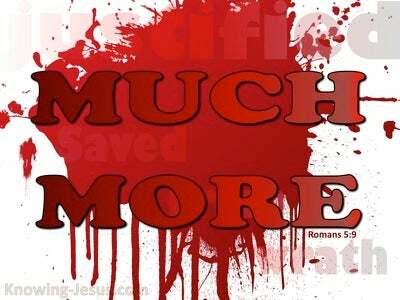 Perfect in His sacrifice. Perfect in His timing. Perfect in all His fullness, for in Him all the fullness of the Godhead dwells bodily and in Him is all the fullness of joy – for He is the One that fills all things in every way. 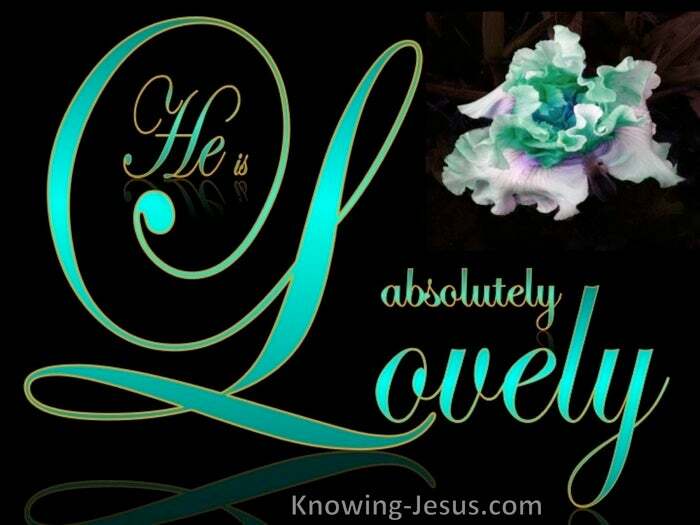 Father dear Father, thank You for my precious Saviour Jesus Christ Who is altogether lovely. Thank You for sending Him to be the truth of the gospel of grace that has brought light and life to my dead, dark soul - Praise Your wonderful name. AMEN.